(KJIPUKTUK), HALIFAX - MetCap Living, one of the largest landlords in Nova Scotia, is not providing safe and healthy homes, tenants say. A rally this Thursday was organized by the Dartmouth chapter of ACORN Nova Scotia, an organization that advocates on behalf of low income Nova Scotians. The fifteen or so MetCap tenants, who demonstrated in front of the company's office in North Dartmouth, say that they have to deal with mould, leaky ceilings, bugs and vermin, insecure buildings and bad record keeping. For many, security is the biggest concern. “The hallways are unsafe. The back door gets stuck open all the time. Our super keeps closing it, but we need cameras bad,” tenant Marianne MacLeod tells the Halifax Media Co-op. “People are doing heroin and drugs right in the hallway, it's very dangerous. I find syringes,” she says. The state of the units is another concern, says tenant Lisa Fairn, who mentions how requests to fix cracks in her unit's walls have fallen on deaf ears. Administrative errors are another ongoing issue that causes tenants a lot of grief and stress. An earlier rally by Dartmouth tenants led to a meeting between ACORN and MetCap property manager Teddy Zaghloul. That meeting didn't really go anywhere, says Brigley. “He says he has never heard of any of these issues, and he thinks MetCap is gold,” Brigley says. Yet frequent news reports from Nova Scotia, Quebec, and Ontario tell a different story. Complaints about MetCap Living elsewhere in Canada are remarkably similar to the ones heard in North Dartmouth. In Nova Scotia MetCap Living also owns or manages properties in Spryfield, Clayton Park, Sydney, Glace Bay,Truro and Kentville. Canada-wide it owns about 23,000 units. 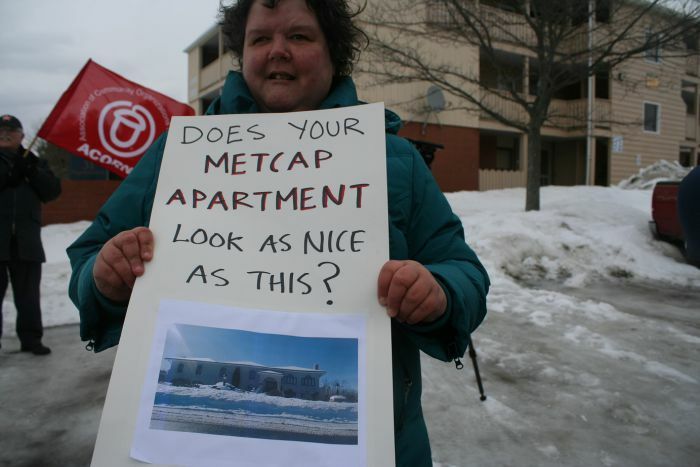 No matter where in Canada, MetCap Living mostly targets low income tenants. And controversy and accusations much like the ones made by the Dartmouth tenants follow MetCap Living wherever it has a presence. MetCap Living president Brent Merril, when asked about yet another series of tenants' complaints, this time about one of his Toronto properties, suggests to the Globe and Mail that slow responses and minimal upkeep are simply part of the way it does business. "I hate to say this, but it's the government," Mr. Merrill tells the Globe and Mail. "If your revenue doesn't go up, and your expenses are going up like 10 per cent, what gives? What gives for a landlord? He has to cut back on capital." This is why it is more difficult to make “cosmetic repairs”, he explains. ACORN Nova Scotia intends to keep the pressure on MetCap, while also continuing to advocate for rent control and municipal landlord licensing. “We aren't out to constantly bash landlords,” says Brigley. 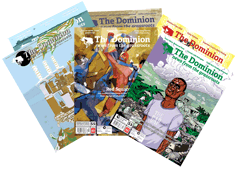 “We simply want to improve communications between landlords and tenants.